Astatine is a radioactive chemical element with the symbol At and atomic number 85. It is the heaviest of the halogens. This highly radioactive element has been confirmed by mass spectrometers to behave chemically much like other halogens, especially iodine (it would probably accumulate in the thyroid gland like iodine), though astatine is thought to be more metallic than iodine. Researchers at the Brookhaven National Laboratory have performed experiments that have identified and measured elementary reactions that involve astatine; however, chemical research into astatine is limited by its extreme rarity, which is a consequence of its extremely short half-life. Its most stable isotope has a half-life of around 8.3 hours. The final product of the decay of astatine is an isotope of lead. Following the color trends of the halogens, you will notice that the elements get darker in color. Following the trends, astatine is expected to be a nearly black solid, which, when heated, sublimes into a dark, purplish vapor (darker than iodine). Astatine is expected to form ionic bonds with metals such as sodium, like the other halogens, but it can be displaced from the salts by lighter, more reactive halogens. Astatine can also react with hydrogen to form hydrogen astatide, which when dissolved in water, forms hydroastatic acid. 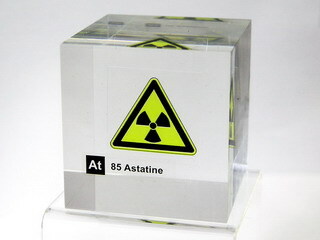 Astatine is the least reactive of the halogens, being less reactive than iodine.